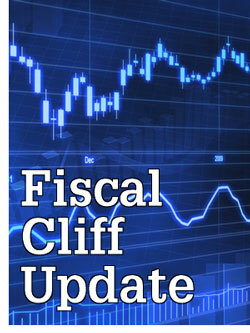 UPDATE: Click here for a convenient PDF document that covers the latest fiscal cliff news. In the early morning hours of Jan. 1, 2013, the Senate, by a vote of 89-8, passed H.R.8, the "American Taxpayer Relief Act" (the Act). Late on that same day - hours after the government had technically gone over the "fiscal cliff" - the House of Representatives, by a vote of 257 to 167, also passed the bill. The Act, which the President is expect to quickly sign into law, would prevent many of the tax hikes that were scheduled to go into effect this year and retain many favorable tax breaks that were scheduled to expire. However, it would also increase income taxes for some high-income individuals and slightly increase transfer tax rates. This article provides an overview of the Act's key provisions. Tax rates. For tax years beginning after 2012, the income tax rates for individuals will stay at 10%, 15%, 25%, 28%, 33% and 35% (instead of moving to 15%, 28%, 31%, 36% and 39.6% as would have occurred under the EGTRRA sunset), but with a 39.6% rate applying for income above a certain threshold (specifically, income in excess of the “applicable threshold” over the dollar amount at which the 35% bracket begins). The applicable threshold is $450,000 for joint filers and surviving spouses; $425,000 for heads of household; $400,000 for single filers; and $225,000 (one-half of the otherwise applicable amount for joint filers) for married taxpayers filing separately. These dollar amounts are inflation-adjusted for tax years after 2013. PEP limitations to apply to “high-earners.” For tax years beginning after 2012, the Personal Exemption Phaseout (PEP), which had previously been suspended, is reinstated with a starting threshold for those making $300,000 for joint filers and a surviving spouse; $275,000 for heads of household; $250,000 for single filers; and $150,000 (one-half of the otherwise applicable amount for joint filers) for married taxpayers filing separately. Under the phaseout, the total amount of exemptions that can be claimed by a taxpayer subject to the limitation is reduced by 2% for each $2,500 (or portion thereof) by which the taxpayer's AGI exceeds the applicable threshold. These dollar amounts are inflation-adjusted for tax years after 2013. For taxpayers whose ordinary income is generally taxed at a rate below 25%, capital gains and dividends will permanently be subject to a 0% rate. (Under the EGTRRA/JGTRRA sunset provisions, long-term capital gain of lower-income taxpayers was to be taxed at a maximum rate of 10%, with an 8% rate for assets held more than five years, and dividends were to be subject to ordinary income rates.) Taxpayers who are subject to a 25%-or-greater rate on ordinary income, but whose income levels fall below the $400,000/$450,000 thresholds, will continue to be subject to a 15% rate on capital gains and dividends. The rate will be 18.8% for those subject to the surtax. Transfer tax provisions kept intact with slight rate increase. The Act prevents steep increases in estate, gift and generation-skipping transfer (GST) tax that were slated to occur for individuals dying and gifts made after 2012 by permanently keeping the exemption level at $5,000,000 (as indexed for inflation). However, the Act also permanently increases the top estate, gift and rate from 35% to 40%. The Act also continues the portability feature that allows the estate of the first spouse to die to transfer his or her unused exclusion to the surviving spouse. All changes are effective for individuals dying and gifts made after 2012. Permanent AMT relief. The Act provides permanent alternative minimum tax (AMT) relief. The AMT is the excess, if any, of the tentative minimum tax for the year over the regular tax for the year. In arriving at the tentative minimum tax, an individual begins with taxable income, modifies it with various adjustments and preferences, and then subtracts an exemption amount (which phases out at higher income levels). The result is alternative minimum taxable income (AMTI), which is subject to an AMT rate of 26% or 28%. Prior to the Act, for 2012, nonrefundable personal credits—other than the adoption credit, the child credit, the savers' credit, the residential energy efficient property credit, the non-depreciable property portions of the alternative motor vehicle credit, the qualified plug-in electric vehicle credit, and the new qualified plug-in electric drive motor vehicle credit—were to be allowed only to the extent that the individual's regular income tax liability exceeded his tentative minimum tax, determined without regard to the minimum tax foreign tax credit. Retroactively effective for tax years beginning after 2011, the Act permanently allows an individual to offset his entire regular tax liability and AMT liability by the nonrefundable personal credits. tax-free distributions from individual retirement plans for charitable purposes, which expired at the end of 2011 and which is now revived for 2012 and continued through 2013. Because 2012 has already passed, a special rule permits distributions taken in 2012 to be transferred to charities for a limited period in 2013. Another special rule permits certain distributions made in 2013 as being deemed made on Dec. 31, 2012.
special expensing rules for certain film and television productions; and the election to expense mine safety equipment. The Act also extends and modifies the bonus depreciation provisions with respect to property placed in service after Dec. 31, 2012, in tax years ending after that date. The Code Sec. 41 research credit is modified and retroactively extended for two years through 2013. The temporary minimum low-income tax credit rate for nonfederally subsidized new buildings under Code Sec. 42(b)(2)(A) is extended to apply to housing credit dollar amount allocations made before Jan. 1, 2014. The Code Sec. 45A Indian employment tax credit is retroactively extended for two years through 2013. The Code Sec. 45D new markets tax credits is retroactively extended for two years through 2013. The Code Sec. 45G railroad track maintenance credit is retroactively extended for two years through 2013. The Code Sec. 45N mine rescue team training credit is retroactively extended for two years through 2013. The Code Sec. 45P employer wage credit for employees who are active duty members of the uniformed services is retroactively extended for two years through 2013. The Code Sec. 51 work opportunity tax credit is retroactively extended for two years through 2013. Code Sec. 54E qualified zone academy bonds are retroactively extended for two years through 2013. The enhanced charitable deduction for contributions of food inventory under Code Sec. 174(e) is retroactively extended for two years through 2013. Allowance of the domestic production activities deduction for activities in Puerto Rico, for the first eight tax years of the taxpayer beginning after Dec. 31, 2005, and before Jan. 1, 2014. Exclusion from a tax-exempt organization's unrelated business taxable income (UBTI) of interest, rent, royalties, and annuities paid to it from a controlled entity under Code Sec. 512(b)(13)(E)(iv) is extended through Dec. 31, 2013. Treatment of certain dividends of regulated investment companies (RICs) as “interest-related dividends” is extended through Dec. 31, 2013. Inclusion of RICs in the definition of a “qualified investment entity” under Code Sec. 897(h)(4) is extended through Dec. 31, 2013. The exception under subpart F for active financing income (i.e., certain income from the active conduct of a banking, financing, insurance, or similar business) under Code Sec. 953(e)(10) and Code Sec. 954 (h)(9) for tax years of a foreign corporation beginning after Dec. 31, '98, and before Jan. 1, 2014, for tax years of foreign corporations beginning after Dec. 31, 2005, and before Jan. 1, 2014. Look-through treatment for payments between related controlled foreign corporations (CFCs) under the foreign personal holding company rules under Code Sec. 954(c)(6) is extended through Jan. 1, 2014. Exclusion of 100% of gain on certain small business stock acquired before Jan. 1, 2014. Basis adjustment to stock of S corporations making charitable contributions of property under Code Sec. 1367(a) in tax years beginning before Dec. 31, 2013. The reduction in S corporation recognition period for built-in gains tax under Code Sec. 1374(d)(7) is extended through 2013, with a 10-year period instead of a 5-year period. Various empowerment zone tax incentives, including the designation of an empowerment zone and of additional empowerment zones under Code Sec. 1391(d) (extended through Dec. 31, 2013) and the period for which the percentage exclusion for qualified small business stock (of a corporation which is a qualified business entity) is 60%Code Sec. 1202(a)(2) (extended through Dec. 31, 2018). Tax-exempt financing for New York Liberty Zone under Code Sec. 1400L(d)(2) is extended for bonds issued before Jan. 1, 2014. Temporary increase in limit on cover over run excise taxes to Puerto Rico and the Virgin Islands is extended for spirits brought into the U.S. before Jan. 1, 2014. American Samoa economic development credit, as modified, is extended through Jan. 1, 2014. The additional depreciation deduction allowance for cellulosic biofuel plant property under Code Sec. 168 (l)(2) is modified and extended one year. The alternative fuels excise tax credits under Code Sec. 6426(d )Code Sec. (5) and Code Sec. 6426(e) (3) for sales or use of alternative fuels or alternative fuel mixtures is retroactively extended for two years through 2013. Pension provision. For transfers after Dec. 31, 2012, in tax years ending after that date, plan provisions in an applicable retirement plan (which includes a qualified Roth contribution program) can allow participants to elect to transfer amounts to designated Roth accounts with the transfer being treated as a taxable qualified rollover contribution under Code Sec. 408A(e). UPDATE: The American Institute of CPAs has released its synopsis of the act. Click here to learn more.